Backed by a team of qualified and skilled professionals, we are a formidable organization engaged in distribution of a quality approved assortment of VHB Tapes (Very High Bond Tapes). Owing to the high strength of these closed-cell acrylic foam tapes, these are highly preferred by our esteemed clients around the nation for numerous residential and commercial applications. Annual Turnover2010-11 Rs. 1-2 Crore Approx. We have been able to mark our presence in this highly competitive market by offering a cost effective range of BOPP Tapes, PP Box Strapping, Stretch Film & Power Products (UPS, Inverter, etc) to the customers since 2002. 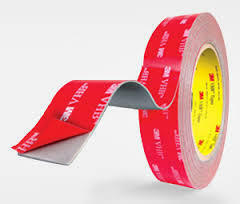 Over and above this, the range of our products includes 3M Masking Tapes, VHB Tapes (Very High Bond Tapes), Permanent Protection Tapes, 3M Protective Tapes. Moreover, we are engaged in offering Online UPS, Offline UPS, Servo Stabilisers. We are the authorised distributor an of 3M Industrial Adhesives & Tapes, Orient Abrasives (A Div of Grindwell Norton Ltd). The firm’s future outlook is to further improve its strong foothold and competence in its field through its different lines and wide client base. It is also strongly committed for developing, expanding and diversifying its presence in the trading and consumer sector also. For further details feel free to contact on given below email id.